Tesco also have a few other offers on with Patak's though not sure if these are cheapest. Worth checking out all the same. There are other offers at Tesco e.g. Patak's Biryani Hot & Spicy (350g) £1 reduced from £1.65 (28.6p/100g), and they do work out slightly cheaper than the above, though it appears these aren't the same as those I've posted in my OP. 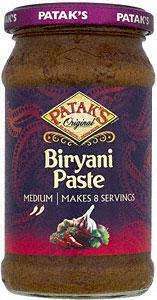 In the search box type in Pataks paste and it will bring up all the flavours which includes bogof for some reason the link to this page does not work. I can't stand Pataks pre-made sauces, but the pastes aren't too bad for making your own curry. Anyone know if it's instore too? The sauces are nasty but the pastes make an excellent base for curries. I'll be stocking up. "Pataks" sounded like "Buttocks" in a foreign accent ..
i was giggling all the way through ..
Errr, am I missing something? The pastes are showing at £1.78 bogof, not £1???? Thanks for find. There paste are faaaar better than the sauces. Went into my local, they're £1.99 BOGOF. Picked up the Madras and Tikka Masala pastes for the weekend family feast. Errr, am I missing something? The pastes are showing at £1.78 bogof, not … Errr, am I missing something? The pastes are showing at £1.78 bogof, not £1???? I've just updated my OP as I had it saying £1.79 any 2 FOR 1 instead of £1.78 any 2 FOR 1. If you can find a B&M near you, might be worth checking out. Went into my local, they're £1.99 BOGOF.Picked up the Madras and Tikka … Went into my local, they're £1.99 BOGOF.Picked up the Madras and Tikka Masala pastes for the weekend family feast. Yeah, I was in Tesco, Mogden Lane in Isleworth this afternoon and noticed that as well. Saw an ad on TV for Patak's last night... "Pataks" sounded like … Saw an ad on TV for Patak's last night... "Pataks" sounded like "Buttocks" in a foreign accent .. link to tv adsi was giggling all the way through .. Pataks is hot! .. Reminds me of the advert that was band with Lenny Henry doing the voice-over. He was supposed to be saying something like "chuck, chuck, chuck, chuck, chucker" but sounded like something else, and you can imagine what it sounded like. Can't remember the ad though. It's actually the 500g Pataks Indian Cooking Sauce Jars that are 88p in Morrisons, not the paste. Pataks Hot/Tikka Masala/ Vindaloo/Spicy Phal 350g jars are also half price in Morrisons and Pataks Biryani/Medium/ Mild & Fruity/Hot & Spicy 350g jars also half price in Morrisons. Currently 92p each. Not sure if these are pastes or what. These offers are on till 16/10/11.